Thinking of Moving from Blogger to WordPress? At some point most bloggers find themselves in the age old debate of Blogger vs. WordPress. And many contemplate making the leap from Blogger to WordPress but thoughts of making the switch can be scary. I know I was a nervous when I moved from Blogger to WordPress about a year ago. I took the challenge and so CAN you. When I made the switch I did so my researching various transfer tutorials and I made the switch without much difficulty. 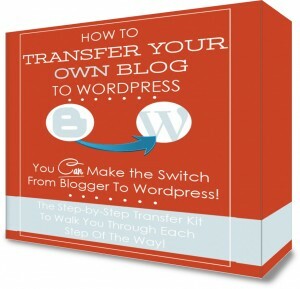 However, Blogelina’s Blogger to WordPress Transfer Kit saves you the hassle of looking up tutorials and puts everything you need for a Do It Yourself Transfer from Blogger to WordPress into one convenient package. I truly wish this kit was around when I decided to move my blog from Blogger. However, that didn’t stop me from snagging a copy for a handy reference when helping any friends or clients make the switch in the future. Unlike me, everyone does not enjoy the techy diy side of blogging; therefore, I do offer blogging help services. But for the fellow DIY selfers, now through November 4th you can save an additional $20 off the transfer kit. That’s right you can get this handy transfer kit for just $17! Disclosure: This post contains affiliates links, which means any products purchased through the links helps support this blog. Yep that Blogelina has all packaged up for those looking to make the trekk. How did your transfer experience go? Anything you wished you had done differently? I don’t blame you Alex. I switched because I wanted to expand my knowledge and a course I was taking I needed a place to practice. Although I have now since discovered they have testing environment for that as well. What an excellent resource, Wanda! You really are my go-to-girl for all things techy and bloggy. Thanks! Always happy to pass along any valuable information I come across Pam. I like WordPress a lot. It’s easy to manage my posts and comments, and it has a lot of really cool themes. Yes it’s has a lot of additional features. I really like be able to use plugins. But it took some getting use when I moved over from Blogger. Wow, Wanda what a wonderful deal! I have considered it…and still am trying to figure out what I want to do. Hi Ella, I’m doing ok. Still plagued by the headaches but otherwise I’m ok. Both platforms has it’s benefits. Hi Wanda! So much good info here! A blog-friend of mine is switching from blogger to wordpress now, and it’s taking a lot of time. I’m sure she wishes she knew about this package! (maybe I’ll send her a link to your article). What were the benefits of moving to WordPress for you? She would definitely find the transfer kit handy in that it has everything she needs in one place. The main benefit to moving to WordPress has been than I’m in control of the content. There’s no fear of my blog being removed as I have heard some people encounter. I also like the added functionality of WordPress with all the great plugins. However, I think Blogger is good and has many benefits as well namely cost.